Descending into a tomb shaft. The Leiden-Turin archaeological mission excavates in the Saqqara “New Kingdom necropolis”. The name for this area on the elevated desert plateau is actually quite misleading – and arguably wrong. Yes, the area was used during the New Kingdom; even quite extensively so. It is, after all, the time when the famed tombs of Horemheb and Maya were built. But their monumental final resting places represent only one temporal “layer” in the long history of the cemetery. This location in the desert was already in use as a burial ground before the time of Horemheb and Maya, as it did long after the New Kingdom. People who lived – and died – in all those periods stretching over more than 3000 years left their mark in exactly this section of the Saqqara necropolis. That is what makes this area so extremely interesting for an archaeologist! The study of the long ‘life history’ of the Saqqara landscape is the focus of my postdoctoral research at Leiden University. It is part of the NWO-funded project The Walking Dead at Saqqara: The Making of a Cultural Geography, led by Lara Weiss. Participating in the Leiden-Turin archaeological fieldwork at Saqqara provides the unique opportunity to gather data necessary for my research. New Kingdom Saqqara: view over the monumental tomb of Horemheb to the Step Pyramid of Djoser. More than 3.000 years of human activity in 5 square metres! Ancient Egyptians often structured, used and experienced the desert landscape differently from the people who lived (long) before and after them. At the same time, however, material traces from the past, such as tombs, influenced the actions of later Egyptians. 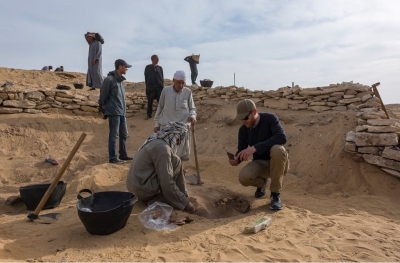 The area that we are excavating in this season presents a very nice opportunity to study the activities of people over a long period of time: from the New Kingdom to the Coptic period, and beyond. It is an area possibly located in between two truly monumental tombs, bordered by Maya in the south and an unknown neighbour in the north. One generation later, in the so-called Ramesside period, the cemetery had become much overcrowded. Therefore, tomb chapels of modest dimensions were constructed in the limited spaces available in between and around the larger tombs. Two such chapels were already uncovered during last season, and the traces of a third were – and still are – just visible from the sand. It is very tempting to clear the sand and reveal the identity of the tomb owner. However, we also want to know what happened to the chapel long after the last visitor had placed an offering there. The archaeological examination takes time, but this will eventually yield interesting new insights! 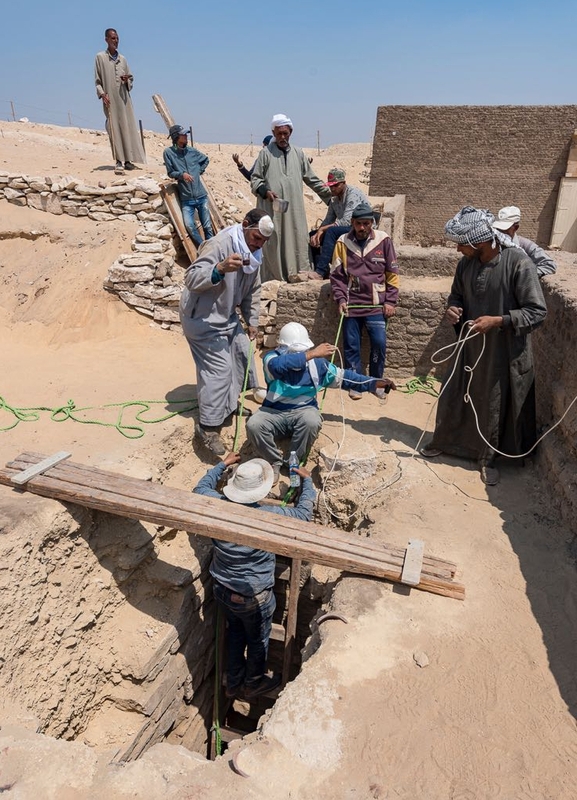 We now know that the area above the chapel was used in the Coptic period in the first centuries A.D., and that much later, robbers searching for valuables dug holes all around in order to locate the tomb shaft. More than 3000 years of human activity in an excavation pit of only 5 square metres! 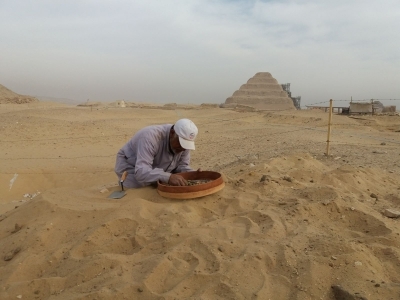 An Egyptian workman carefully sieving finds. When I arrived at the excavation two weeks ago, my focus was on the layers postdating the chapels. After their abandonment, a thick layer of windblown sand had accumulated on them. In this clean sand layer, we found various deposits of materials used during the mummification process: so-called embalmers’ caches. These do not date to the time the chapels were built, but much later: the so-called Late Period. Also last year a number of these puzzling caches were found in the same general area. All include broken pottery of various forms mixed with ash and decomposed organic material such as straw or chaff. After documentation in the field, the potsherds were collected and taken to our pottery specialist, Valentina Gasperini. To everyone’s surprise, potsherds found in various unconnected caches could be joined and glued together! These caches were not so unconnected after all. The materials must have once been deposited together and – for some reason unknown – ended up in separate locations. Further study will undoubtedly provide an answer to the question of what exactly happened! Nico Staring examining an embalmers’ cache. Valentina Gasparini tells us about the pottery found at Sakkara in this video. This week saw the start of the emptying of the tomb shaft situated in front of yet another small chapel that was discovered last year. Excavating the sand from under their feet, two of our workmen slowly descended into the tomb’s subterranean area. 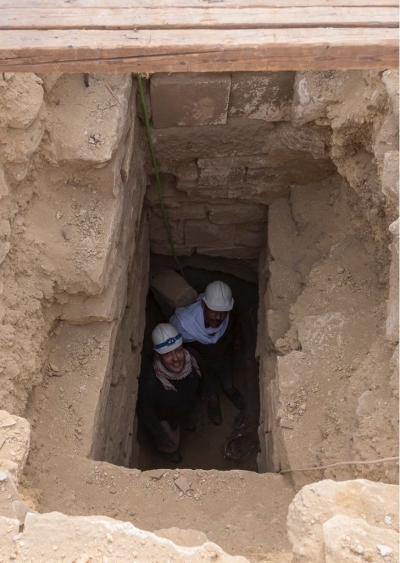 The bottom of the shaft was reached at approximately 4.5 metres and Paolo Del Vesco, accompanied by our curious inspector of antiquities, endeavoured into the claustrophobic burial chamber. The underground of the entire Saqqara plateau is honeycombed with such chambers and passages. The more than 3000 years of tomb building have clearly altered not only on the desert surface, but also impacted on the underground “landscape”. With a little help from ancient and pre-modern robbers, many of these chambers and passages have been connected to one another. This often facilitates easy access into the burial chamber of a neighbouring tomb. Whether this will also be the case in this shaft remains to be seen. Stay tuned for the next Digging Diary! Paolo Del Vesco exploring the perilous depths of a tomb shaft.